The Kent Furniture Co. was founded ca. 1897 by Edwin Clarence Kent (1868-1945). According to his gravestone at East End Cemetery in Wytheville, Virginia, available on FindAGrave.com, E. Clarence Kent was born 13 January 1868 and died 15 December 1945. He appeared in the 1900 U. S. Census, age 32, living at 100 Marshall Street, Petersburg. An early partner with E. Clarence Kent was Isham Raymond Dyer (1866-1928). Isham R. Dyer's death certificate says that he was born 26 November 1866 in Chesterfield County, Virginia, and that he died 6 January 1928 in Petersburg, Virginia. FindAGrave.com indexes his gravesite in Blandford Cemetery, Petersburg. Other Dyers were employed at Kent Furniture, including Isham R. Dyer's father, George Whitlock Dyer (1843-1936), and his brother, Richard Ferguson Dyer (1875-1955). George W. Dyer died age 92 years, 11 months and 29 days on 21 June 1936. His grave marker at Blandford Cemetery indicated that he served in the Confederate Army during the Civil War (Company C, 9th Virginia Infanty). Richard F. Dyer registered for the World War I draft in 1918, age 42, when he was a salesman at Kent Furniture Co., Petersburg. Another longtime employee at Kent Furniture was Thomas Carson Gregory (1880-1971). T. Carson Gregory was listed as a salesman and then as Secretary and Vice-President, and later as credit manager at Kent Furniture from 1905 through 1960. In his World War II draft registration in 1942 at age 62 he said he was employed by Mr. Ben Alperin, Kent's Inc., Petersburg. Benjamin Alperin (1879-1954) was President of Kent Furniture from 1931 to the mid-1940s. He then became Chairman of the Board, and his son, Ralph Milton Alperin (1917-2001) took over as President. Benjamin Alperin was not a native born Virginian. He was born in Austria, and immigrated to the U. S. in 1881, then became a naturalized citizen in 1902. In 1902 he lived in New York City and gave his occupation as "stenographer." In 1918 he registered for the World War I draft, age 38, when he ran a confectioner's business in Red Bank, New Jersey. Benjamin Alperin's daughter, Alberta Alperin, married Louis A. Rosenstock Jr. Louis A. Rosenstock Jr. (1911-1990) was the grandson of Anthony Rosenstock, founder of A. Rosenstock, Dry Goods, whose history can be read on the Rosenstock page. Louis A. Rosenstock Jr. was listed in Petersburg city directories as an officer at Kent Furniture from 1939 through 1960. This ad for Kent Furniture Co. appeared in Hill's Petersburg City Directory, 1897. Their address at that time was 129 Sycamore St. Around 1915 this section of Sycamore St. was renumbered, and 129 North Sycamore became 230 North Sycamore. This ad for Kent Furniture Co. appeared in The Southern Planter, 1913. This ad for Kent Furniture Co. appeared in Game and Fish Conservationist, July-August 1925. The claim was 27 years in business - i.e., founded 1898. This ad for Kent Furniture Co. appeared in the Petersburg Progress-Index, Tuesday, 10 November 1959. The story of Kent Furniture's sales when the new town of Hopewell and the U. S. Army installation of Camp Lee were created nearby in 1915 is told in some detail in an article in The Grand Rapids Furniture Record, January, 1918, available online on google books. The article includes a photo of E. C. Kent and of Kent's building on Sycamore St. Isham R. Dyer is mentioned as "our star salesman." The Hopewell News (Hopewell, Va.), announced the liquidation of Kent Furniture, 15 May 1980. 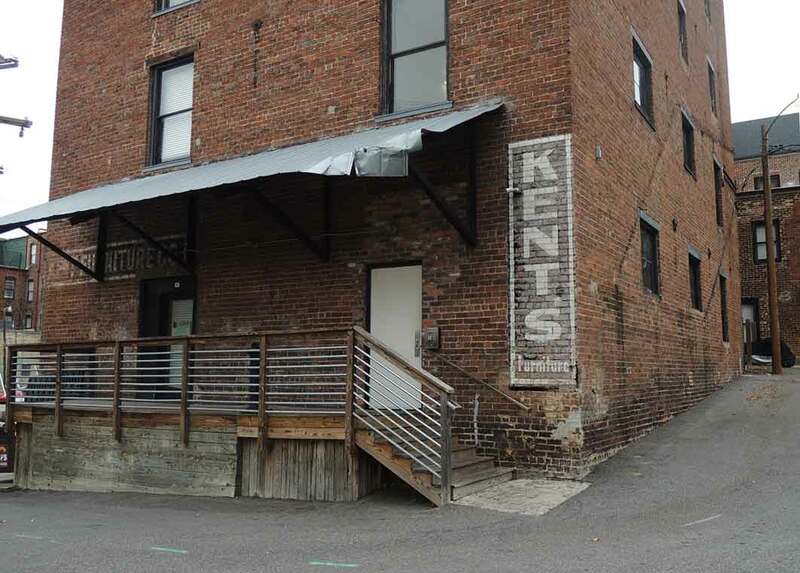 The Kent Furniture building at 228-230 North Sycamore St. was certified as part of the Petersburg Courthouse Historic Distract on the National Register of Historic Places in 1990. The following description was included in the application form, "Kent's Furniture. Italianate commercial block. Semidetached. ca. 1840-1860. Brick (stretcher bond); 4 stories; 8 bays (symmetrical); gable roof. Mid-20th-c. storefront, black Carrara-glass storefront surround, awning; upper facade has 6/6 sash with segmental arches, cast-iron window hoods and sills, cast-iron cornice; original cornice replaced with present cast-iron cornice around 1900; half of upper-facade windows are boarded."